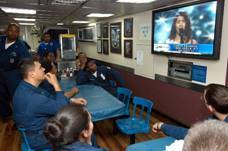 When the US Navy came calling.. . Machinist's Mate 1st Class William Velasco, from Batanes, Philippines, is surrounded by shipmates as he anxiously watches his daughter, Camile Velasco, 18, of Maui, Hawaii, as she performs on the nationally televised show, American Idol. Jasmine Trias the other Fil-Am American Idol Finalist. Rudy Trias is with his daughter during the ongoing sing-out, he is on leave from his job with the Fleet Technical Support Center at the Pearl Harbor Naval Shipyard, where his colleagues dutifully watch and vote. "I call them weekly, phone and tell them what's up," he said. an engineering technician, where he works on the submarines at the Pearl Harbor naval shipyard. The US Navy stopped recruiting Filipino nationals at the end of 1992, ending a unique program under which tens of thousands of Filipinos served in the Navy since the Spanish-American War when the Philippines became a US colony. The recruitment of Filipino Sailors was formalized in 1947, when the US and the Philippines signed an agreement on military bases. The agreement allowed the US to maintain military bases in the Philippines. The end of Filipino recruitment resulted partly from the end of the base agreement and partly from the reduction in the military. Filipinos were the only foreign nationals allowed to enlist in the US Armed Forces without immigrating to this country and the Navy was the only military branch they could join. live rather handsomely in his Philippine hometown. U.S. Navy, with 2000 enlistments by l946. enlist has always exceeded the number of available openings. Competition is keen for the limited slots. (Regents of the University of California. Letters in Exile. I am getting a copy of the US-Philippine treaty that ratified our contract in 1953. A former US Army Veteran who worked hard in behalf of the WW2 Filipino Veteran in Washington. I was lucky to shake hand with Guillermo O Rumingan who was arrested in the White House demonstration couple of months ago. He is a former US soldier who fought the Japanese during the last war and currently attached to the Philippine Embassy Veterans Affairs. 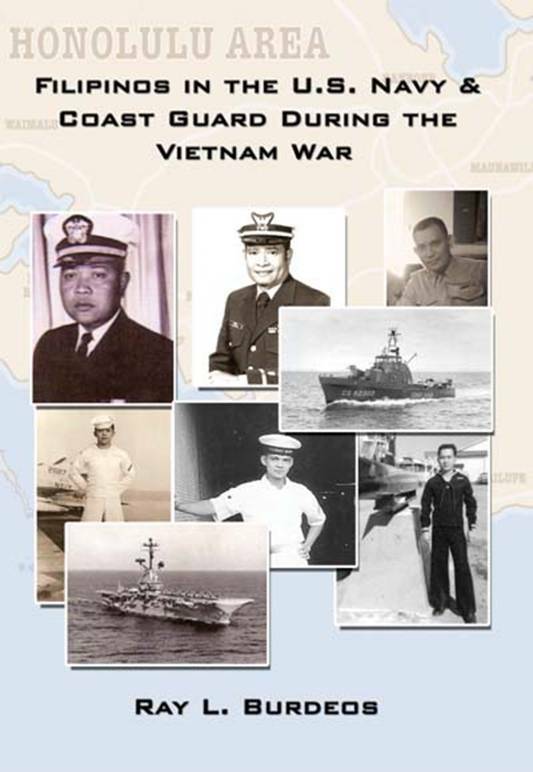 During the height of US Navy recruitment there were more Filipino Sailors in the US Navy than in the Philippine Navy. Some of the recruits were assigned in the US Coast Guard. Earlier recruitment was processed in Sangley Point prior to the closing in the late 60's. Filipino boys eager to see the world were lining up at the Main Gate daily. The processing of enlistment was later moved to Subic Bay. The only known armed forces that had similar foreign acceptance would be the French Foreign Legion (soldier of fortune) and the Gurkhas' enlistment in the British Army. Thousands of Filipinos took advantage of this enlistment to find a way to come to America. Prior to the liberation of the immigration law in the early 1970's, the US Navy provided the easiest and fastest way of seeing the world and earning a living at the same time. Today we find them settled in coastal regions of United States communities of San Diego, San Francisco, Charleston, Norfolk, Jacksonville, and other military cities. The second generation of children makes up a large part of the student body in Norfolk. A small portion of the retirees went back to the Philippines to live solely and comfortably on Navy Pension. They fared well while the US military bases were still open. This is the 50th anniversary of the initial enlistment in 1947. I am not surprised to see that one of the "you might be a Filipino" traits was "if one of your parents is in the US Navy." For us it is not only an adventure but also a profession. We made it a career and most of us stayed for life (lifer as it was known). Our marine instinct made it easy. I am calling former and active US Navy and Coast Guard to join me in creating a support web site. The least we can do is share our sea stories and in process find old buddy.